Starts and finishes: Sde Boker. 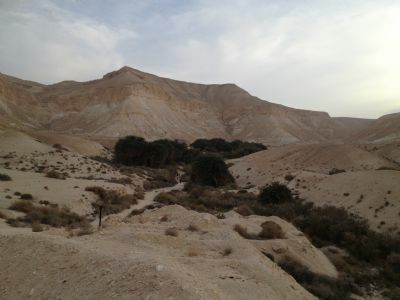 We will cross the Tzin Plateau and descend via the Tzin Ascent along the oil pipe pline road that will lead us to the amazing Zik and Shaviv Oases where we will hike in the dense undergrowth nourished by ancient water that wells to the surface. Our next stop will be to visit the Akev spring, close by but completely different to the oases, where those that wish may enjoy a swim in the deep cool pool fed by the spring. Refreshed we will reurn to the jeep and continue towards the Halukim hills above Sde Boker stopping to enjoy the scenery and visit the sites as we go including the intriguing Ma'agora Stronghold which challenges the theories regarding ancient settlement here eons ago. After crossing the wide valley of Wadi Boker/Habsor we will ascend the towering Boker hills that command a stunning view of the whole region before continuing via Wadi Noked to the famous accacia tree there and then on to the end of our trip. Lunch - not included, we can stop in Mdreshet Ben Gurion for a light lunch or we can provide a picnic. Price: 6 seat Landrover Discovery (up to 6 passengers) 1,850 NIS per jeep or 1,580 NIS for tourists. 8 seat Landrover Defender 2,100 NIS per jeep (up to 8 people) or 1,800 NIS for tourists. Tourist price, without VAT, only on presentation of a valid entry visa and foreign passport. Activity by prior reservation through our office.